I guess this is a kind of depressing wall for what's supposed to be a happy occasion. But I guess it's alright. I wanted to try and portray the slightly darker, sadder side of our songstress. Even the Pink Princess can get depressed; it happens to everyone and we all learn to deal with it in our own way. We can't let take over our lives. The original scan had text and bad colour so of course I vectored it. After that, I had to design the background. 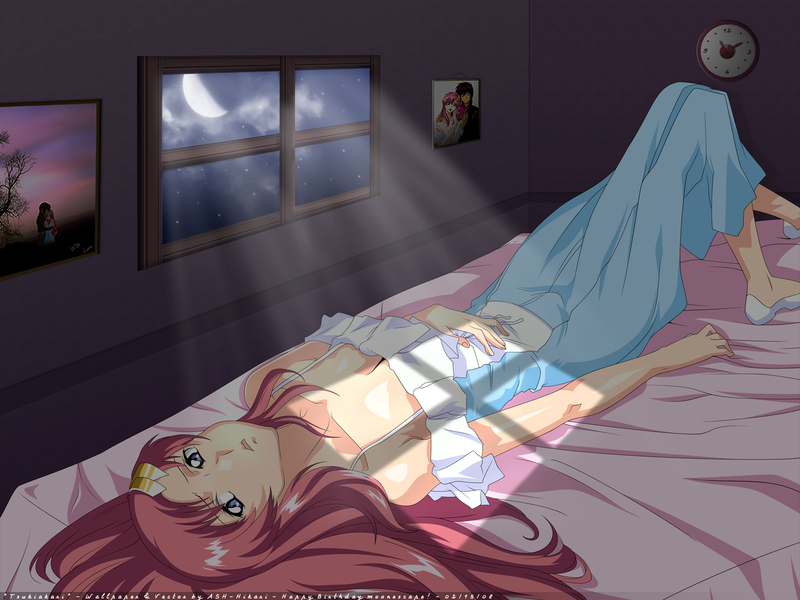 Basic scenario: Lacus is lying backwards on her bed, late at night, moonlight streaming through her window. I guess designing her room was fun. At first I just made the window, but the walls looked way too empty, so I gave them some colour, pattern, and paneling. Then I added a photo of Kira and Lacus on the wall. Then the Haro clock. Gotta love the Haro clock! Although it wouldn't really work :P I added a painting of sorts to the left of the wall, and added Kira and Lacus in the painting. Everything in this wall is made from scratch, except for the painting (stock), and the moon/clouds (brush). Therefore I'm sure the perspective is kind of off lol XD Ah well. but anyway, the vector is just sooooooooooooo gorgeous that i cant even describe how much i love it! the room design is just so cool and the window and the shading...... everythings just soooooooo beautiful/perfect! I love the vector, best one I've seen of her. touches you added to make it her own. on the vector, + highlighted in the group. absolutely goregous! Moonlight is really perfect, reflection on her body too, and pics of them are so cute hanging on the walls, and ofcourse most important is: vector is just to beautiful,lines are perfect, all the same size, and lol 44 layers for all? i would have 500+! You are cool :D thanks for sharing! Great work! :) I love the streaks of moonlight shining down and the window shadow on Lacus. wow! this is so pretty..I like the way you positioned Lacus in the bed :) Really great work..
wow. i really like how you've done the room. with the pictures you've added. looks realistic! and the vector is well done as usual XD very neat and clean. same as my comment in AP. and not one of your best works. like you said, the perspective looks a bit off but the whole rest makes up for it. gorgeous vector and great idea. That moonlight is really pretty and greatly done. The room is just so cool! My favorite part of this wall is the lighting. It's so awesome! The vectoring is neatly done and it's nice to see a rather different look at GSD. Not all happy-yay-for-friends, you know? The bedroom is very well done, and Lacus is a beauty in bed indeed. The moonlight also goes well with her milky skin as well. I guess she's in deep thought... Very good wall! One thing I have to say is that the window shadow is kinda... straight. I think it should actually bend and slip into the folds of her clothes and around her arms, because at the moment it makes it 2D.